D.D. Reddy | I.K International Publishing House Pvt. 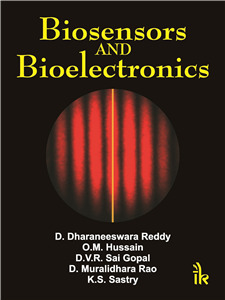 Ltd.
D. Dharaneeswara Reddy is Assistant Professor, Department of Biotechnology, Sree Vidyanikethan Engineering College, Tirupati. He was awarded M.Sc., in 2000 with Biotechnology specialization from S.V. University, Tirupati and completed M.Tech in Biotechnology in 2008 from J.N.T.H. University, Hyderabad respectively. He worked as Production Manager in AG Bioteck Laboratories (I) Ltd., Hyderabad during 2000-03. He joined as Assistant Professor, Department of Biotechnology, Alfa College of Engineering & Technology during 2004-06. Later he joined as Scientist and manager in Biotechnology Center, Hyderabad during 2006-08. He has around 5 years of industry and 7 years of teaching and research experience. He worked as a guest faculty to M.Sc., Microbiology course from 2004 – 2006 at Sree Ramakrishna Degree College, Andhra Pradesh. He also served as the subject expert, BOS of the Biotechnology Department at Sri Ramakrishna Degree College during 2004-2006. He guided 7 students for M.Tech in Biotechnology and many students for B.Tech, M.Sc and B.Sc in Biotechnology. He is a life member and fellow in Society for Applied Biotechnology; Biotechnology, Bioinformatics and Bioengineering and membership in Indian Society for Technical Education (ISTE) and the Indian Science Congress Association (ISCA).